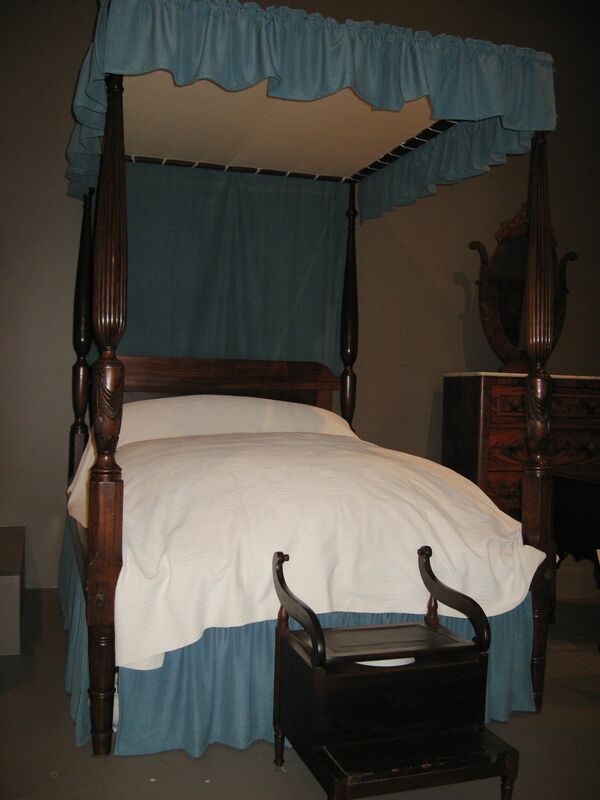 The following photographs are pictures I took of period furniture displayed in the Maryland Historical Society. During the writing of the novel, I had to do a lot more research than this, but it gave me start. Charles Pinkney, U.S. Attorney General, used this inkstand to write a draft of the declaration of war against Great Britain in 1812. 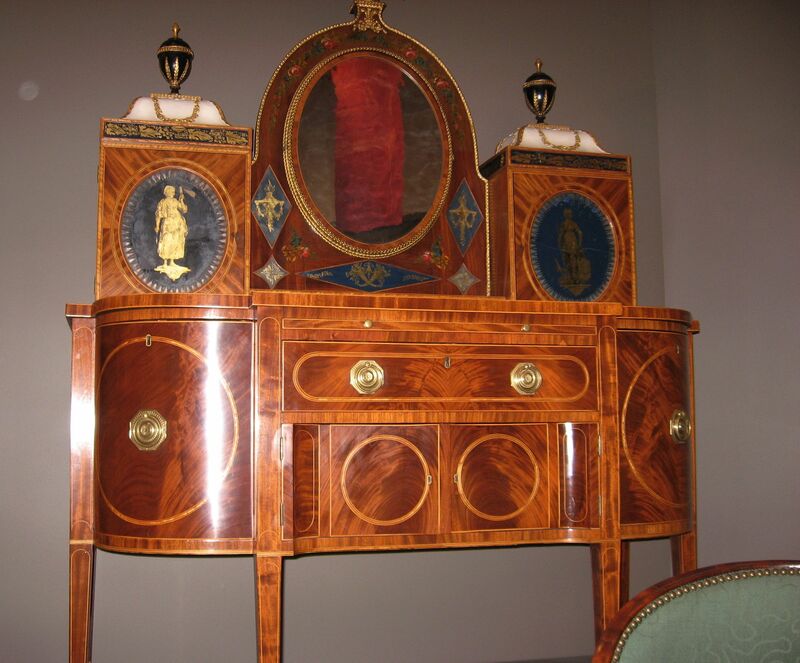 I didn’t use anything like this particular piece of furniture in the novel, but I love the exuberance of this dressing table. The figures on the upper doors represented Commerce and Industry. 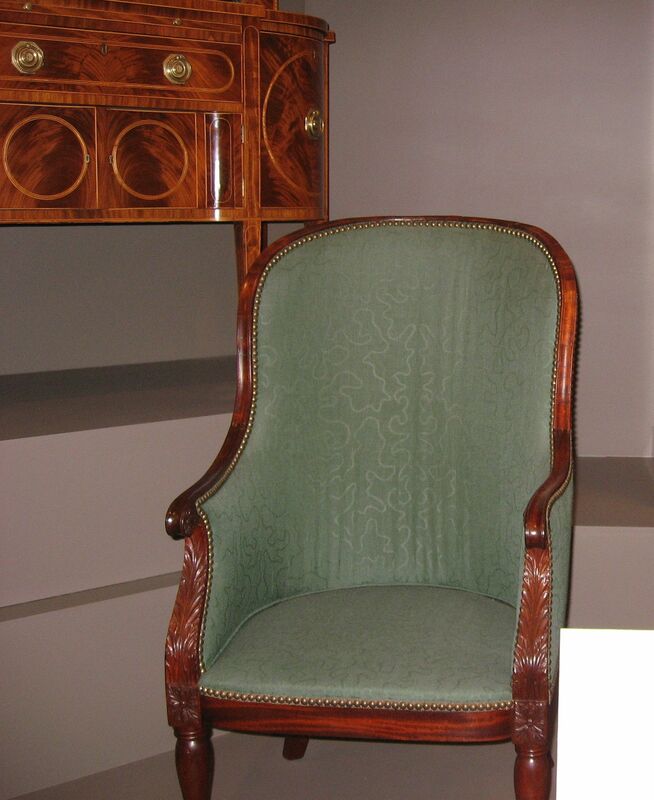 This armchair inspired me to choose teal upholstery for the furniture Betsy’s parents had in their drawing room. 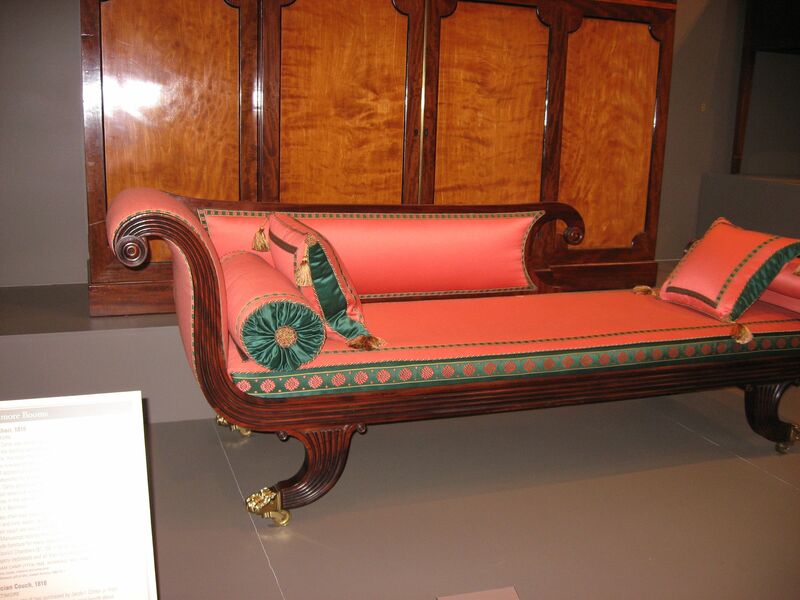 I love the color combination on the Grecian couch. It helped me to realize that the color palette from Betsy’s time period wasn’t quite as somber as I might have assumed. 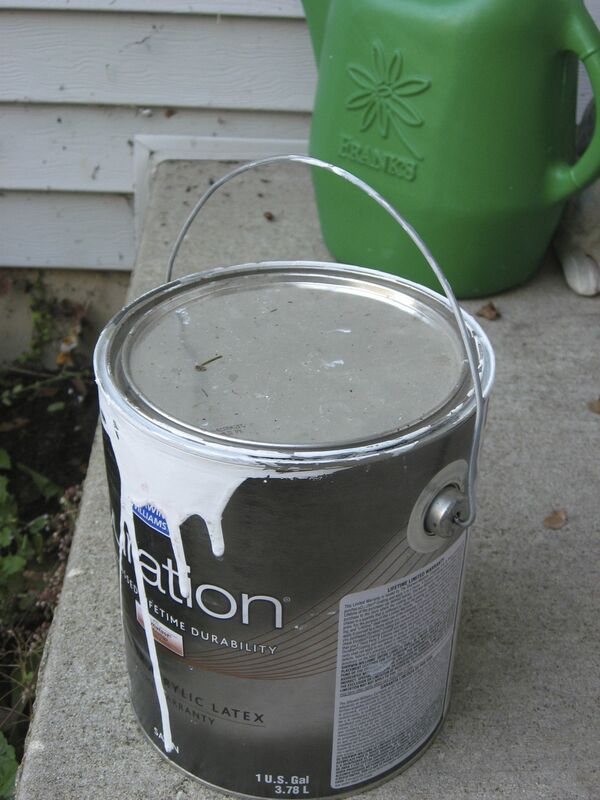 Why on earth is there a photograph of a messy paint can on a writing blog? Yesterday, we had two important pre-winter maintenance jobs done on our house: we hired a handyman to paint the trim and sealcoat the driveway. We live in a climate with both hot and cold extremes, which can be very hard on buildings and pavements. The repainting usually has to be done every five years or so. The sealcoating every other year. Neither my husband nor I are particularly handy with home repair jobs, so unless it’s something on the order of hanging a picture, we usually have to hire someone else to do it. This time we used a man who’s done a lot of odd jobs for one of our neighbors, so we felt confident that he did quality work. And we weren’t disappointed. He inspected the wood trim of the house carefully, caulked any cracks he found, replaced one piece of trim from which a piece had rotted away, and then applied two coats of durable paint. He was equally meticulous with the sealcoating. It occurs to me that this process is a lot like what’s going on with my novel right now. The manuscript has started coming back from the copy editor for me to review. In terms of grammar, spelling, usage, and mechanics, the corrections are very light. I’ve worked in publishing for 24 years, so I made sure to send him the cleanest copy that I could. However, he is still finding little cracks and holes in the narrative—places where I could crank up the tension a bit with an appropriate action or gesture and dialogue where choosing a slightly different word might enhance the period feel. Part of me is impatient to get this stage over with and move on to the production process to send my baby out into the world, but yesterday as I worked through some of the editor’s comments, I realized that I can’t rush this important step. Once the book is published, I will have lost my chance to do any further “maintenance” on it. As with the house repairs, I have a skilled workman performing this task to make up for any deficiencies I might bring to the project. I need to trust him. I need to listen. In many ways, the important thing about writing is the process, not the end product. Yesterday, I had to learn that lesson all over again. Somehow I suspect that this won’t be the last time. Two years ago when I was visiting Baltimore for research, my husband and I toured the Homewood House Museum. Homewood was the mansion of Charles Carroll, Jr., son of Charles Carroll of Carrollton (the only Catholic to sign the Declaration of Independence). Today, Homewood is beautifully restored, decorated, and furnished to authentically represent how it originally looked. It’s located on the campus of Johns Hopkins University, and I strongly recommend visiting it if you’re ever in Baltimore. Elizabeth Patterson Bonaparte almost certainly attended parties at Homewood in its heyday. Not only were the Pattersons and Carrolls both leading Maryland families, they were also intimately connected. 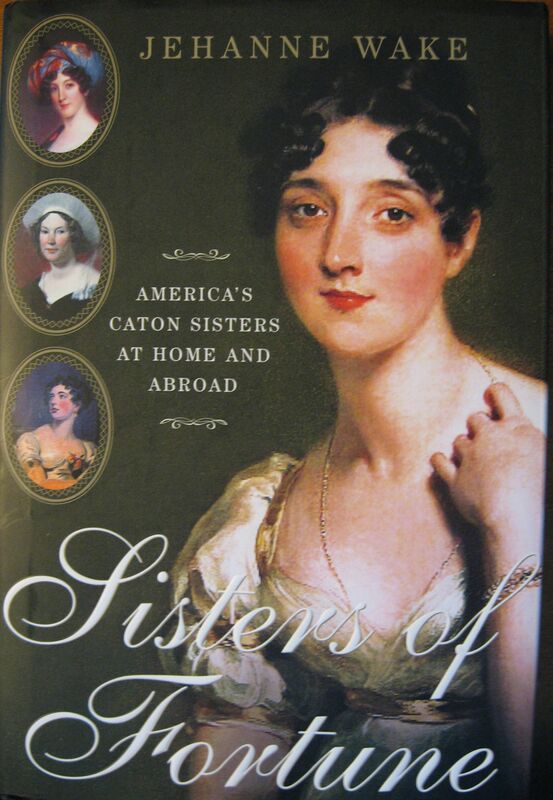 In 1806, Betsy’s older brother Robert married Charles Carroll, Jr.’s niece, Marianne. So Homewood was a must-see for me. The day we visited, I told the woman who was going to be our guide that I was there to do research for a historical novel, but I did not name my subject. I was scrupulous about keeping that information private until I finished my manuscript. As we toured the mansion, our docent led us into a room they have furnished as Mrs. Carroll’s dressing room. 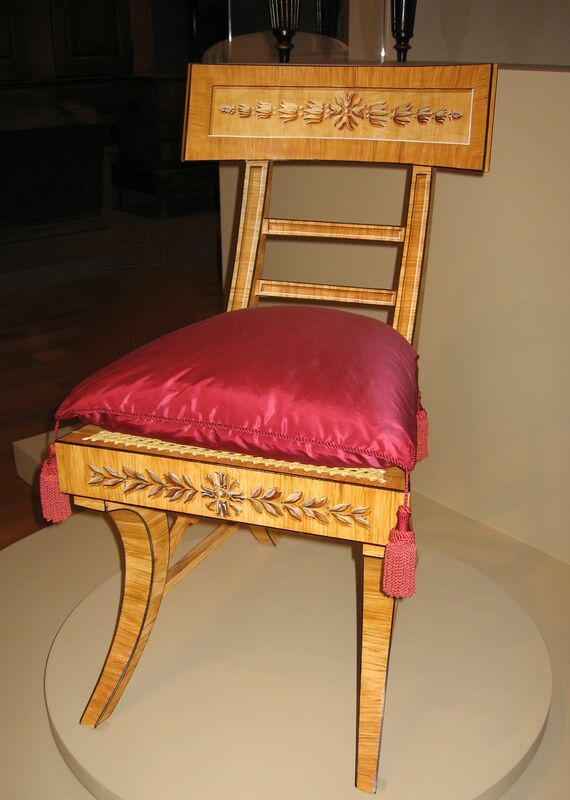 Almost directly in front of where I was standing was what looked to be a small, low mahogany table with slender neoclassical legs. Set within an arch-shaped opening in the “table” was a recessed silver basin. (You can see it in the third image on this page.) The docent announced in a somewhat amused voice that this piece of furniture was a bidet that had once belonged to Betsy Bonaparte. The docent didn’t elaborate—and because I was keeping my special interest in Betsy a secret—I didn’t press her for information. I must admit that I had a very difficult time keeping a straight face. You see, up until that moment, I hadn’t really thought about Betsy in terms of her bodily functions, so unexpectedly encountering her bidet was disconcerting. It turned out, however, to be enormously helpful to me as a novelist, because it allowed me to think of her in an earthier way. She became more of a flesh-and-blood woman to me than just a hazy historical figure. After we returned home, I did some Internet research and found an article originally published in the Baltimore Sun (Rath, Molly, “You Never Know What Will Turn Up Among the Collectibles at the Maryland Historical Society,” November 20, 1994). 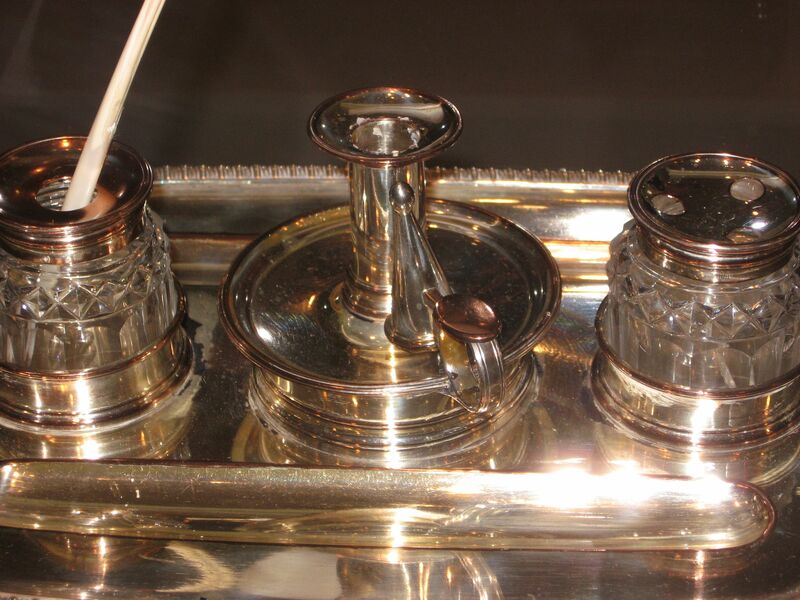 According to that article the silver basin in the bidet was inscribed with the name of Napoleon’s own silversmith. I can only assume that Jerome gave it to Betsy after they married—or bought it for their home. The article also mentioned that Betsy carried a porcelain bourdaloue with her when she traveled. A bourdaloue is basically a fancy, French porta potty shaped something like a gravy boat—a handy thing to have for those long 19th-century carriage rides. I find it difficult to imagine Betsy hiking up her skirts and taking a tinkle in a public coach, but maybe she used it in the shrubbery during stops along the way. And she and Jerome did travel extensively in their own privately owned coach and six, so theoretically, she could have used it there. Both the bidet and the bourdaloue were left to the Maryland Historical Society (MdHS) by Betsy’s grandson. At first, the curators at MdHS didn’t realize what the bourdaloue was. Thinking it was an extra large sauce dish, they put it on display as part of a table setting—until a porcelain expert enlightened them about its true function. Since Betsy was known for her sharp sense of humor, I feel certain she would have been amused. “What is wrong?” Captain Stephenson demanded. Just a hint of this can go a long way toward making a speaker sound foreign, and it’s much less phony than writing something like “Tree weeks ago, a notice I ret tescribing dis ship,” etc. While I was planning the plot of The Ambitious Madame Bonaparte, I had to deal with what I call information lag. In the current age of instant communication, it’s hard to remember how long it once took for news to travel. 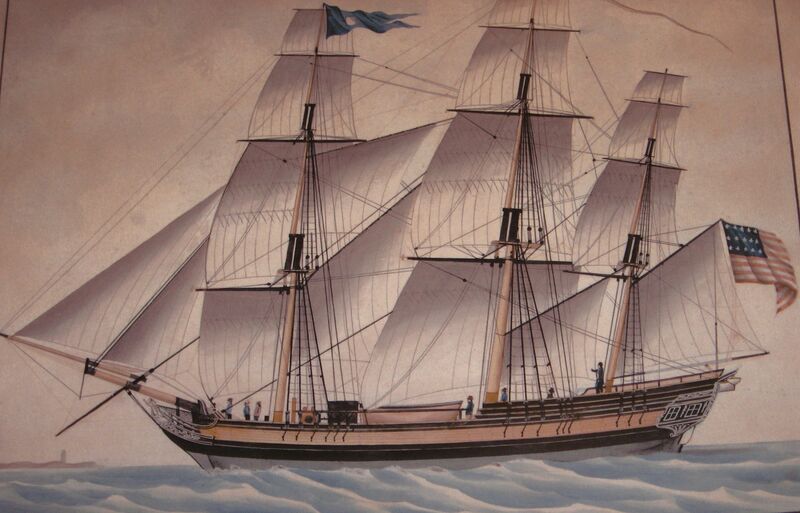 In the early 1800s, it took a day to travel the 45 miles from Baltimore to Washington. It could take four days to go from Baltimore to New York. Not only were the travel times long, but mail was not secure. Travelers sometimes amused themselves by opening and reading packets of letters that were in transit. The times for transatlantic travel were obviously much worse. An exceptionally fast ship could make the crossing in three weeks, but six weeks to two months was more typical. As a result, information lag had a huge impact on the love story in my novel. Think about it. You’re a lusty young man, impulsive by nature, who is accustomed to using your position as Napoleon’s brother to get what you want. On a brief visit to the United States, you meet the most beautiful, witty girl you’ve ever encountered. You know your brother would expect you to ask him before you decide to marry, but frankly, you’re tired of being treated like a child—and it’s obvious that you have many rivals for the young woman’s hand. Would you want to wait four months for a ship to cross the Atlantic and back again to find out what your family thinks of your choice? Especially knowing that the letter might be lost and you’ll have to start all over again six months from now?